Three more teams booked their place in the 2013 U16 European Championship quarter-finals. From Group F, the Czech Republic, France and Hungary join Italy in the quarter-finals draw. Belgium and the Netherlands on the other hand must now prepare themselves for the 9th -16th Classification Round. In Group E, Russia and Spain, already qualified for the quarter-finals, remain the only teams unbeaten in the competition. The last two places will be decided between Croatia, Latvia and Turkey. For Greece, the title challenge may be over. If Latvia beat them, Latvia then secure a place in the last eight. In the exhibition games in Group G, Sweden needed overtime to win their first match of the championship (65-64) against the Slovak Republic. Lithuania's strong third quarter was enough for them to get past the hosts Bulgaria (56-48). Aida Sow (in picture above) came off the bench and knocked down 7-from-10 shots to help herself to 15 points as France beat Belgium (68-56). It was a game that neither team could afford to lose. For the first 20 minutes it remained tight with Belgium holding the lead (25-22). 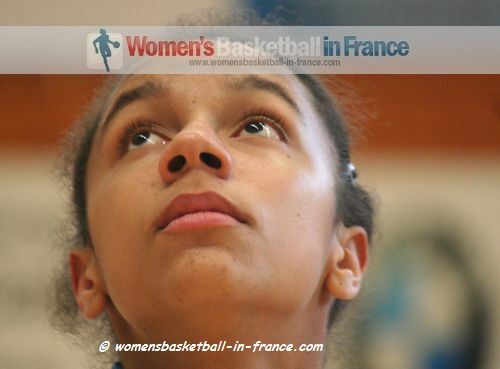 France made up a 5-point deficit and went into the lead for good on the 26-minute mark with a drive to the basket by Ornella Bankole (19 points). Earlier in the day in Group F the Czech Republic ended the unbeaten run of Italy in this European Championship (57-52) in a U16 classic. The Netherlands went to their traditional zone press for most of the first quarter and led Hungary (14-10) at the end of the first quarter. Hungary put together an 11-0 run during the second quarter and went into the locker room leading (33-23). The Netherlands did all they could during the second half. But the ball just refused to drop and Hungary held on to their advantage to win (54-45). Spain waited until the last five minutes of the game to put down Latvia (63-54) with a 11-0 run. With this victory their unbeaten run stays intact. It was another thrilling game with Spain having to work very hard for the win. Maria Conde was the leading scoring for Spain with 18 points and 10 rebounds while Laura Grabe had 12 points for Latvia. Russia needed 18 points apiece by Maria Vadeeva and Raisa Musina to get past Croatia (72-51). Ivana Dojkic scored 16 points for Croatia. Spain and Russian will meet in the last group game to determine who wins Group E and take the only unbeaten record into the third phase of the European Championship. Turkey kept their tournament ambitions alive with a game winning three-pointer by Sevgi Uzun with six seconds remaining to beat Greece (44-41). With this defeat Greece are the first team from this group to be eliminated.